You AND YOUR LYRICS could be FEATURED on the next limited edition Russian Bear bottle. Two years ago premium vodka brand, Russian Bear and local hip hop artist, Riky Rick joined forces. The collab led to an iconic Limited Edition Russian Bear x Riky Rick bottle featuring the man himself and his freshest lyrics. Now, it could be you. If you think “I AM NEXT”, write the fieriest lyrics about reaching the next level and not only could you bag yourself a limited edition Russian Bear x Riky Rick bottle, but you could be featured next on the limited edition Russian Bear bottle along with your lyrics. All you have to do is pen your lyrics on the Russian Bear website, or via Twitter and Instagram using #IamNext and tagging @RussianBearSA before Tuesday, 27 December. The rules are simple: submit one line per entry and enter as many times as you like – keeping your lyrics hip hop fresh but also PG. Russian Bear will reward 50 fans who penned the best lyrics with the limited edition Russian Bear x Riky Rick bottle, emblazoned with the face and lyrics of Boss Zonke himself. 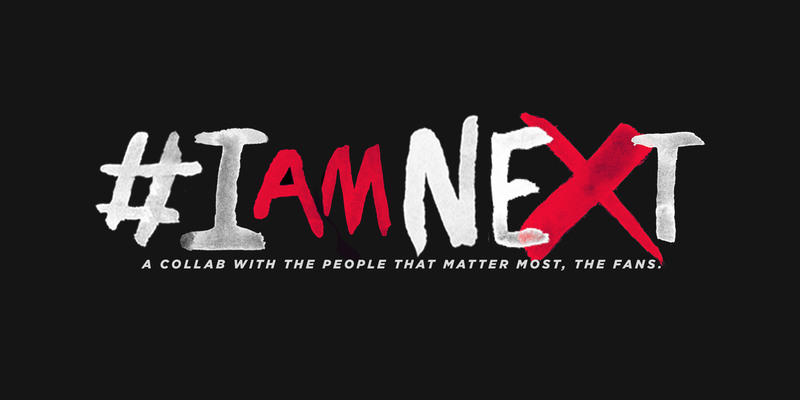 The top three will get to feature in the Russian Bear film series “I AM NEXT” – and one lucky grand prize winner will receive his own bottle design sporting his or her lyrics and likeness. For more information on Russian Bear and the #IamNext competition, visit www.russianbear.co.za , @RussianBearSA on Twitter and Facebook. Russian Bear x Riky Rick bottle available for sale exclusively at Ultra Liquors, while stocks last. Only 810 bottles are available nationwide. RSP R119.99. Not for Sale to Persons under the Age of 18. Please Enjoy Responsibly. This entry was posted in Uncategorized on December 20, 2016 by shaunjengel. 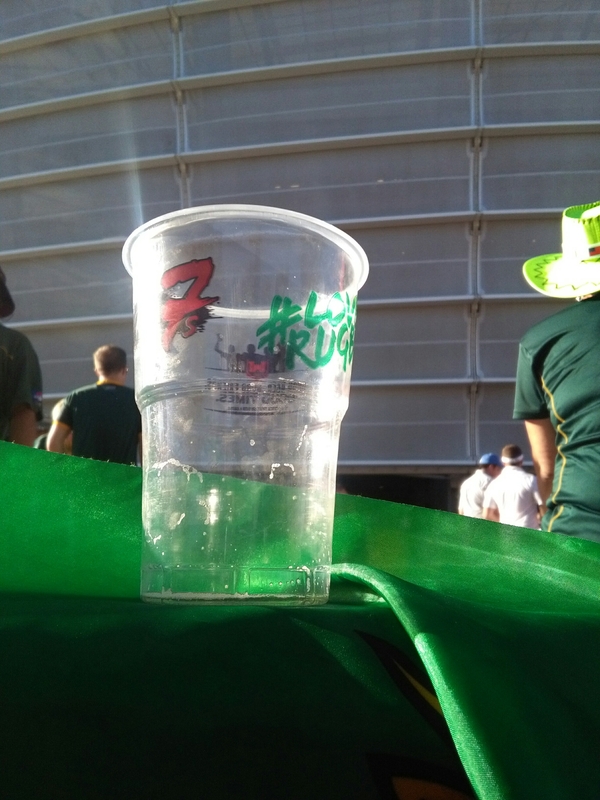 For the second year Cape Town fans got their taste of Sevens Rugby as the second leg of the HSBC Sevens Rugby series landed on our shores, we were ready for the Blitzbokke to defend their title after a successful weekend in Dubai. 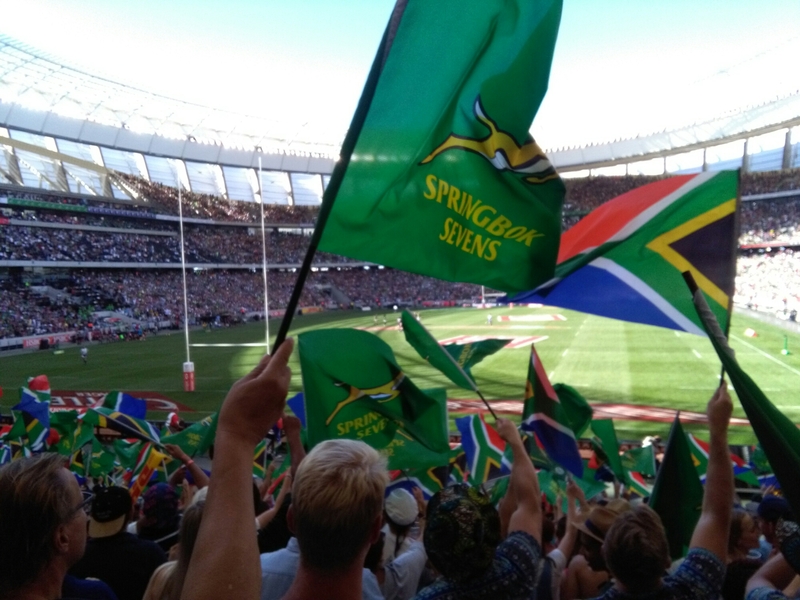 +- 50 000 screaming fans filled the Cape Town Stadium yesterday, the atmosphere was electric everytime the Blitzbokke played the fans went crazy. Flags waving, fans singing at the top of their voices to the sounds of Kaptein Span die Seile hoping to get a glimpse of themselves on the karaoke cam. 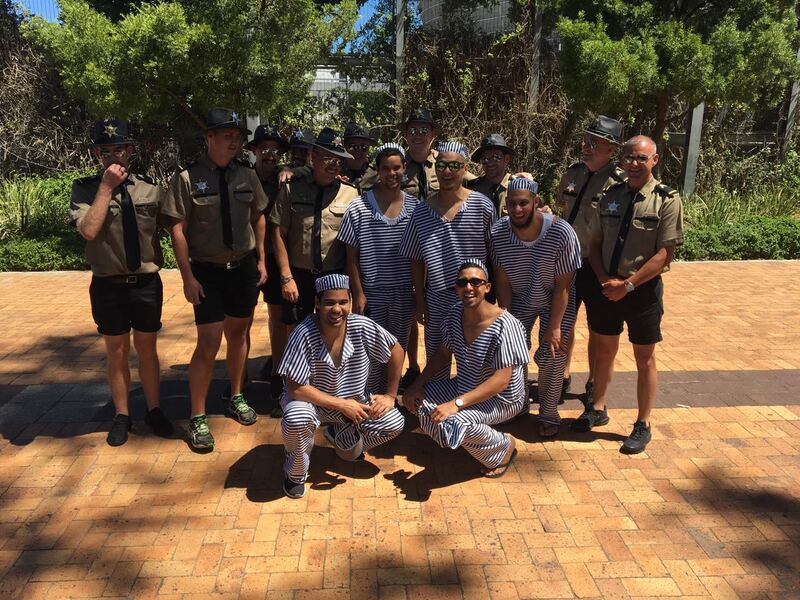 …we escaped from Prison to support the Blitsbokke because WE LOVE RUGBY, our costumes courtesy of my cousin Monique Hess. The day was filled with more than just Rugby, we were entertained by Beatboxer Geaorge Avakian, Micheal Jackson and Tina Turner (impersonaters ofcourse) also made an appearance plus our very own Melvis vannie Belhaaaaaar in his Blue Suede Graasies. asseblief meneer moen my nie skollie noem nie. 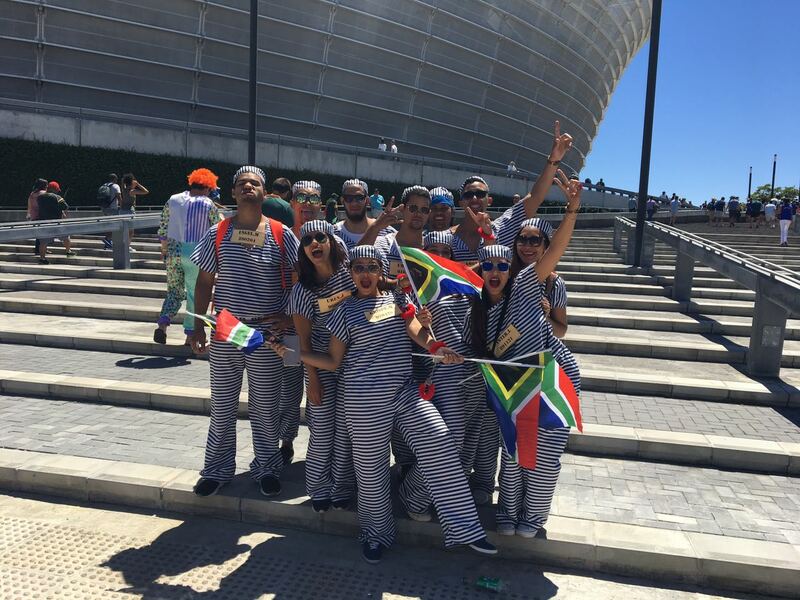 We really felt like celebrities, probably because the series Prison Break is coming back. Even though the Blitzbokke lost in the final to England, we still had an amazing time, this was an awesome way to kick off the festive season in Cape Town. This entry was posted in Uncategorized on December 12, 2016 by shaunjengel. 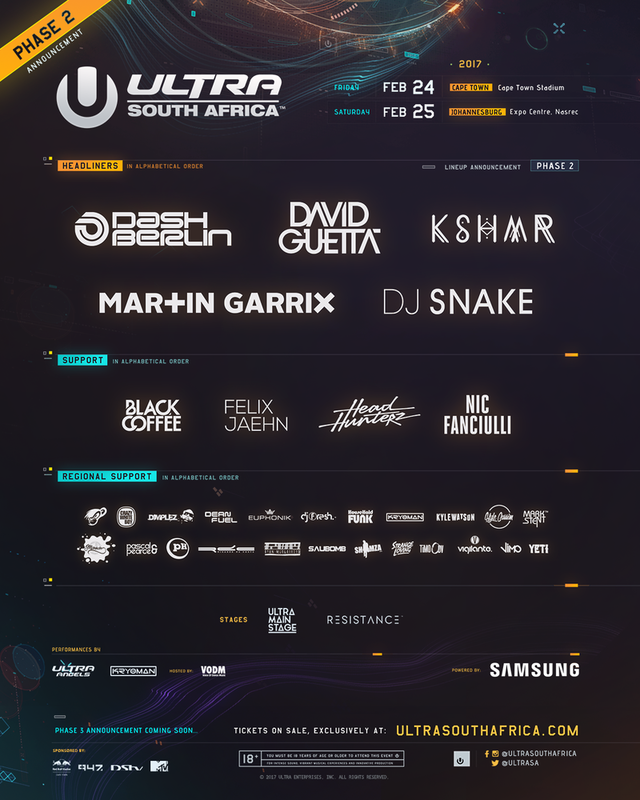 ​International superstars Dash Berlin, KSHMR and DJ Snake will join the previously announced headliners David Guetta and Martin Garrix on the ULTRA SOUTH AFRICA main stage in 2017. Support from the likes of Black Coffee, Felix Jaehn, Headhunterz and Nic Fanciulli round out the highly anticipated Phase Two lineup for ULTRA South Africa. DASH BERLIN is no stranger to ULTRA South Africa; this Dutch trance veteran has been contributing to the international scene for over a decade. He’s worked with icons such as Justin Timberlake, Usher, N.E.R.D. and Lenny Kravitz to name just a few. His performance on ULTRA South Africa’s main stage in 2016 blew the crowd away; expect Dash to bring energy levels to a peak at ULTRA in February. KSHMR (pronounced Kashmir), real name Niles Hollowell-Dhar, was awarded “The Highest New Entry” on DJ Mag’s Top 100 DJ list, and has since moved up 11 places this year to the No.12 spot. As a producer, he’s one of the world’s best and most loved, but as a live act he takes things to a whole new level. DJ SNAKE is the French DJ and record producer stunning the dance music world with his ability to create smash hit after smash hit. He most recently launched his first studio album ‘Encore’ featuring collaborations with icons Justin Bieber, Skrillex and more. DJ SNAKE was also behind one of the biggest and most iconic soundtracks of this generation, his collaboration with Major Lazer – “Lean On”. Expect to hear a range of unreleased future hits from Snake’s performance at ULTRA South Africa. The eclectic support lineup is packed full of international superstars including HEADHUNTERZ , real name William Rebergen, the Dutch DJ who is known for his hard hitting, energetic sets and who has worked with previous ULTRA South Africa artists like W&W and Krewella. HEADHUNTERZ will be shaking up the sound with his banging big room set in Cape Town and JHB. Next up, FELIX JAEHN, the prodigal German tropical house DJ and producer that went number 1 in 20 countries with his remix of OMI’s cheerleader, will bring a summer sound to SA that that will surely get the girls dancing and the boys smiling. ULTRA South Africa will also be bringing the RESISTANCE stage back, with its deep and grimy sound for those that like to get down and dirty…. NIC FANCIULLI needs little introduction after completing a truly successful RESISTANCE world tour in 2016 with ULTRA Worldwide. Anyone who watched him on the RESISTANCE stages around the world or was at the legendary Space Ibiza closing party will know exactly how good this British DJ and producer is at getting a dance floor going, and keeping it going long into the night. Joining Nic on this year’s RESISTANCE program is BLACK COFFEE. Undoubtedly South Africa’s proudest current export, he started his career around 1995 and since then has played at P Diddy’s house party in Miami, taken home gold at the DJ Awards in Ibiza, remixed Avicii’s ‘Lay Me Down’ and much, much more. Expect him to bring his magical A-Game to the stage; something that Ultranauts will remember long after the festival is over. Plus even more local artists to be announced closer to the February 2017 event. The ULTRA ANGELS will also be returning to beautiful South Africa to grace the stages with their hypnotic dancing and gorgeous costumes. So, in summary, ULTRA SOUTH AFRICA 2017 is bringing 35 top quality artists from around the world to perform over 2 days in 2 cities, on 3 stages per city to tens of thousands of screaming fans at each show! This entry was posted in Uncategorized on December 2, 2016 by shaunjengel.